These highlights do not include all the information needed to use JAKAFI safely and effectively. See full prescribing information for JAKAFI. Doses should be individualized based on safety and efficacy. Starting doses per indication are noted below. Monitor complete blood counts every 2 to 4 weeks until doses are stabilized, and then as clinically indicated. Modify or interrupt dosing for thrombocytopenia. The starting dose of Jakafi is 10 mg given orally twice daily. The recommended starting dose of Jakafi is based on platelet count (Table 1). A complete blood count (CBC) and platelet count must be performed before initiating therapy, every 2 to 4 weeks until doses are stabilized, and then as clinically indicated [see Warnings and Precautions (5.1)]. Doses may be titrated based on safety and efficacy. Maximum doses are displayed. When restarting, begin with a dose at least 5 mg twice daily below the dose at interruption. A complete blood count (CBC) and platelet count must be performed before initiating therapy, every 2 to 4 weeks until doses are stabilized, and then as clinically indicated [see Warnings and Precautions (5.1)]. Continue treatment for at least 2 weeks; if stable, may increase dose by 5 mg twice daily. Modify the Jakafi dosage when coadministered with strong CYP3A4 inhibitors and fluconazole doses of less than or equal to 200 mg [see Drug Interactions (7)], according to Table 7. Make additional dose modifications with frequent monitoring of safety and efficacy. Avoid use of Jakafi in patients with ESRD (CLcr less than 15 mL/min) not requiring dialysis [see Use in Specific Populations (8.6)]. 5 mg tablets - round and white with "INCY" on one side and "5" on the other. 10 mg tablets - round and white with "INCY" on one side and "10" on the other. 15 mg tablets - oval and white with "INCY" on one side and "15" on the other. 20 mg tablets - capsule-shaped and white with "INCY" on one side and "20" on the other. 25 mg tablets - oval and white with "INCY" on one side and "25" on the other. Treatment with Jakafi can cause thrombocytopenia, anemia and neutropenia [see Dosage and Administration (2.1)]. Manage thrombocytopenia by reducing the dose or temporarily interrupting Jakafi. Platelet transfusions may be necessary [see Dosage and Administration (2.1.1), and Adverse Reactions (6.1)]. Severe neutropenia (ANC less than 0.5 X 109/L) was generally reversible by withholding Jakafi until recovery [see Adverse Reactions (6.1)]. Perform a pre-treatment complete blood count (CBC) and monitor CBCs every 2 to 4 weeks until doses are stabilized, and then as clinically indicated [see Dosage and Administration (2.1.1), and Adverse Reactions (6.1)]. Advise patients about early signs and symptoms of herpes zoster and to seek treatment as early as possible if suspected [see Adverse Reactions (6.1)]. Following discontinuation of Jakafi, symptoms from myeloproliferative neoplasms may return to pretreatment levels over a period of approximately one week. 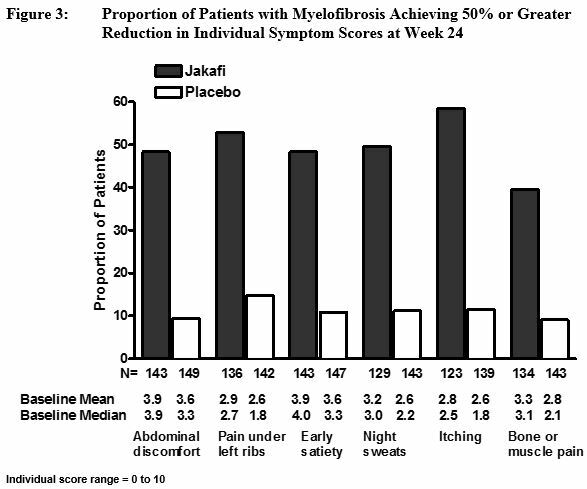 Some patients with MF have experienced one or more of the following adverse events after discontinuing Jakafi: fever, respiratory distress, hypotension, DIC, or multi-organ failure. If one or more of these occur after discontinuation of, or while tapering the dose of Jakafi, evaluate for and treat any intercurrent illness and consider restarting or increasing the dose of Jakafi. Instruct patients not to interrupt or discontinue Jakafi therapy without consulting their physician. When discontinuing or interrupting therapy with Jakafi for reasons other than thrombocytopenia or neutropenia [see Dosage and Administration (2.5)], consider tapering the dose of Jakafi gradually rather than discontinuing abruptly. 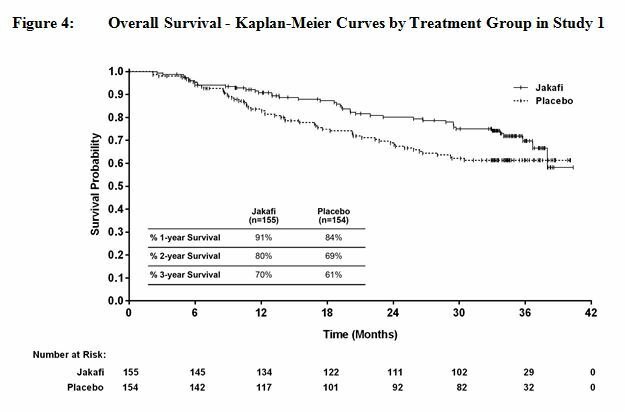 In a randomized, open-label, active-controlled study, 110 patients with PV resistant to or intolerant of hydroxyurea received Jakafi and 111 patients received best available therapy [see Clinical Studies (14.2)]. The most frequent adverse drug reaction was anemia. Table 12 presents the most frequent non-hematologic treatment emergent adverse events occurring up to Week 32. Concomitant administration of Jakafi with fluconazole doses greater than 200 mg daily may increase ruxolitinib exposure due to inhibition of both the CYP3A4 and CYP2C9 metabolic pathways [see Clinical Pharmacology (12.3)]. Increased exposure may increase the risk of exposure-related adverse reactions. Avoid the concomitant use of Jakafi with fluconazole doses of greater than 200 mg daily [see Dosage and Administration (2.3)]. Concomitant administration of Jakafi with strong CYP3A4 inhibitors increases ruxolitinib exposure [see Clinical Pharmacology (12.3)]. Increased exposure may increase the risk of exposure-related adverse reactions. Consider dose reduction when administering Jakafi with strong CYP3A4 inhibitors [see Dosage and Administration (2.3)]. Concomitant administration of Jakafi with strong CYP3A4 inducers may decrease ruxolitinib exposure [see Clinical Pharmacology (12.3)]. No dose adjustment is recommended; however, monitor patients frequently and adjust the Jakafi dose based on safety and efficacy [see Clinical Pharmacology (12.3)]. In a pre- and post-natal development study in rats, pregnant animals were dosed with ruxolitinib from implantation through lactation at doses up to 30 mg/kg/day. There were no drug-related adverse findings in pups for fertility indices or for maternal or embryofetal survival, growth and development parameters at the highest dose evaluated (34% the clinical exposure at the maximum recommended dose of 25 mg twice daily). Jakafi was evaluated in a single-arm, dose-escalation study (NCT01164163) in 27 pediatric patients with relapsed or refractory solid tumors (Cohort A) and 20 with leukemias or myeloproliferative neoplasms (Cohort B). The patients had a median age of 14 years (range, 2 to 21 years) and included 18 children (age 2 to <12 years), and 14 adolescents (age 12 to <17 years). The dose levels tested were 15, 21, 29, 39, or 50 mg/m2 twice daily in 28-day cycles with up to 6 patients per dose group. 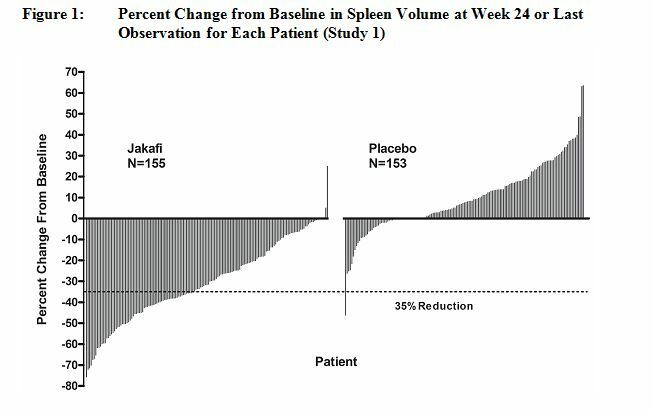 Overall, 38 (81%) patients were treated with no more than a single cycle of Jakafi, while 3, 1, 2, and 3 patients received 2, 3, 4, and 5 or more cycles, respectively. A protocol-defined maximal tolerated dose was not observed, but since few patients were treated for multiple cycles, tolerability with continued use was not assessed adequately to establish a recommended Phase 2 dose. The safety profile in children was similar to that seen in adults. Administration of ruxolitinib to juvenile rats resulted in effects on growth and bone measures. When administered starting at postnatal day 7 (the equivalent of a human newborn) at doses of 1.5 to 75 mg/kg/day, evidence of fractures occurred at doses ≥ 30 mg/kg/day, and effects on body weight and other bone measures [e.g., bone mineral content, peripheral quantitative computed tomography, and x-ray analysis] occurred at doses ≥ 5 mg/kg/day. When administered starting at postnatal day 21 (the equivalent of a human 2-3 years of age) at doses of 5 to 60 mg/kg/day, effects on body weight and bone occurred at doses ≥ 15 mg/kg/day, which were considered adverse at 60 mg/kg/day. Males were more severely affected than females in all age groups, and effects were generally more severe when administration was initiated earlier in the postnatal period. These findings were observed at exposures that are at least 27% the clinical exposure at the maximum recommended dose of 25 mg twice daily. Reduce the Jakafi dosage when administering Jakafi to patients with MF and moderate (CLcr 30 mL/min to 59 mL/min as estimated using Cockcroft-Gault) or severe renal impairment (CLcr 15 mL/min to 29 mL/min) with a platelet count between 50 X 109/L and 150 X 109/L [see Dosage and Administration (2.4) and Clinical Pharmacology (12.3)]. Reduce the Jakafi dosage for patients with PV and moderate (CLcr 30 to 59 mL/min) or severe renal impairment (CLcr 15 to 29 mL/min) [see Dosage and Administration (2.4) and Clinical Pharmacology (12.3)]. Reduce the Jakafi dosage for all patients with ESRD on dialysis [see Dosage and Administration (2.4) and Clinical Pharmacology (12.3)]. Reduce the Jakafi dosage when administering Jakafi to patients with MF and any degree of hepatic impairment (Child-Pugh Class A, B and C) and with a platelet count between 50 X 109/L and 150 X 109/L [see Dosage and Administration (2.4) and Clinical Pharmacology (12.3)]. Reduce the Jakafi dosage for patients with PV and hepatic impairment (Child-Pugh Class A, B and C) [see Dosage and Administration (2.4) and Clinical Pharmacology (12.3)]. MF and PV are myeloproliferative neoplasms (MPN) known to be associated with dysregulated JAK1 and JAK2 signaling. In a mouse model of JAK2V617F-positive MPN, oral administration of ruxolitinib prevented splenomegaly, preferentially decreased JAK2V617F mutant cells in the spleen and decreased circulating inflammatory cytokines (e.g., TNF-α, IL-6). Simulations suggest that fluconazole (a dual CYP3A4 and CYP2C9 inhibitor) increases steady state ruxolitinib AUC by approximately 100% to 300% following concomitant administration of 10 mg of Jakafi twice daily with 100 mg to 400 mg of fluconazole once daily [see Dosage and Administration (2.3) and Drug Interactions (7)]. Ketoconazole (a strong CYP3A4 inhibitor) increased ruxolitinib Cmax by 33% and AUC by 91%. Ketoconazole also prolonged ruxolitinib half-life from 3.7 hours to 6 hours [see Dosage and Administration (2.3) and Drug Interactions (7)]. Erythromycin (a moderate CYP3A4 inhibitor) increased ruxolitinib Cmax by 8% and AUC by 27% [see Drug Interactions (7)]. Rifampin (a strong CYP3A4 inducer) decreased ruxolitinib Cmax by 32% and AUC by 61%. The relative exposure to ruxolitinib’s active metabolites increased approximately 100% [see Drug Interactions (7)]. 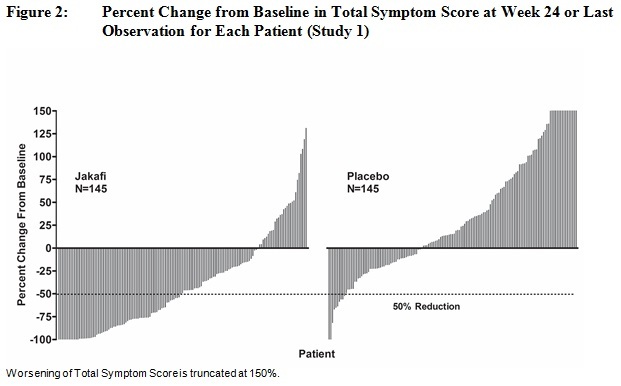 Study 2 (NCT00934544) was an open-label, randomized study in 219 patients. 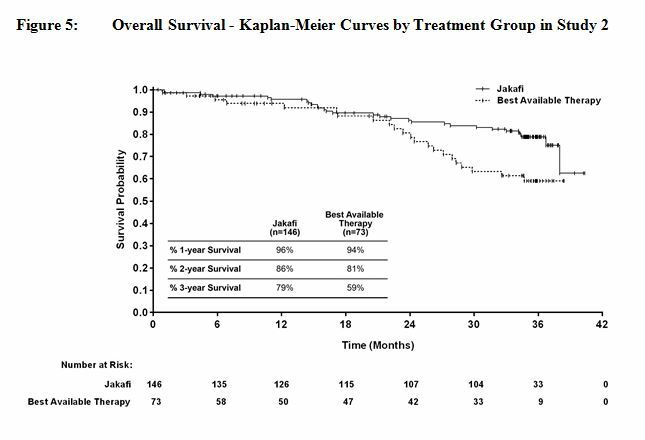 Patients were randomized 2:1 to Jakafi versus best available therapy. Best available therapy was selected by the investigator on a patient-by-patient basis. In the best available therapy arm, the medications received by more than 10% of patients were hydroxyurea (47%) and glucocorticoids (16%). The median age was 66 years (range 35 to 85 years) with 52% of patients older than 65 years and 57% were male. Fifty-three percent (53%) of patients had primary MF, 31% had post-polycythemia vera MF and 16% had post-essential thrombocythemia MF. Twenty-one percent (21%) of patients had red blood cell transfusions within 8 weeks of enrollment in the study. The median hemoglobin count was 10.4 g/dL and the median platelet count was 236 X 109/L. Patients had a median palpable spleen length of 15 cm below the costal margin, with 70% having a spleen length 10 cm or greater below the costal margin. Patients had a median spleen volume as measured by MRI or CT of 2381 cm3 (range 451 cm3 to 7765 cm3). In Study 1, MF symptoms were a secondary endpoint and were measured using the modified Myelofibrosis Symptom Assessment Form (MFSAF) v2.0 diary. The modified MFSAF is a daily diary capturing the core symptoms of MF (abdominal discomfort, pain under left ribs, night sweats, itching, bone/muscle pain and early satiety). Symptom scores ranged from 0 to 10 with 0 representing symptoms "absent" and 10 representing "worst imaginable" symptoms. These scores were added to create the daily total score, which has a maximum of 60. Jakafi is a registered trademark of Incyte. All rights reserved. © 2011-2018 Incyte Corporation. All rights reserved. Read this Patient Information before you start taking Jakafi and each time you get a refill. There may be new information. This information does not take the place of talking to your healthcare provider about your medical condition or treatment. Jakafi is a prescription medicine used to treat certain types of myelofibrosis. Jakafi is also used to treat people with polycythemia vera who have already taken a medicine called hydroxyurea and it did not work well enough or they could not tolerate it. It is not known if Jakafi is safe or effective in children. What should I tell my healthcare provider before taking Jakafi? are pregnant or plan to become pregnant. It is not known if Jakafi will harm your unborn baby. are breastfeeding or plan to breastfeed. It is not known if Jakafi passes into your breast milk. You and your healthcare provider should decide if you will take Jakafi or breastfeed. You should not do both. How should I take Jakafi? If you take too much Jakafi call your healthcare provider or go to the nearest hospital emergency room right away. Take the bottle of Jakafi with you. What are the possible side effects of Jakafi? Skin cancers. Some people who take Jakafi have developed certain types of non-melanoma skin cancers. Tell your healthcare provider if you develop any new or changing skin lesions during treatment with Jakafi. Cholesterol increases. You may have changes in your blood cholesterol levels. Your healthcare provider will do blood tests to check your cholesterol levels during treatment with Jakafi. You may also report side effects to Incyte Corporation at 1-855-463-3463. How should I store Jakafi? Store Jakafi at room temperature from 68°F to 77°F (20°C to 25°C). Keep Jakafi and all medicines out of the reach of children. General information about the safe and effective use of Jakafi. Medicines are sometimes prescribed for purposes other than those listed in Patient Information. Do not use Jakafi for a condition for which it is not prescribed. Do not give Jakafi to other people, even if they have the same symptoms you have. It may harm them. This Patient Information leaflet summarizes the most important information about Jakafi. If you would like more information, talk with your healthcare provider. You can ask your pharmacist or healthcare provider for information that is written for healthcare professionals. For more information call 1-855-463-3463 or go to www.jakafi.com. What are the ingredients in Jakafi? © 2011-2016 Incyte Corporation. All rights reserved.